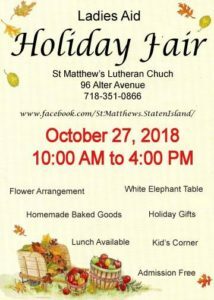 Ladies Aid | Welcome to St. Matthew’s Lutheran Church on Staten Island, New York. In May of 1915, Pastor Hugo Bergdorf had asked the ladies of the congregation to get together to organize a Ladies Aid Society. The first meeting was held in June of 1916. Today, The Ladies Aid meets monthly from September to May. The ladies organize two fundraisers during the year. The Strawberry Festival in May and the Holiday Fair in November. The money raised from these two events, fund our Vacation Bible School Program (VBS), assist with the expenses of the church, i.e. heat and electric, Sunday coffee hour, and various purchases as they occur. They also help support missions such as Bethesda Lutheran Home, Lutheran Bible Translators, and the Staten Island M.S. Society. In December, the ladies host the church’s annual Christmas party on the first Friday. Everyone brings a pot-luck dish and the evening ends with the singing of Christmas carols. It is a wonderful beginning to our Advent Season. In June, the Ladies enjoy an afternoon out at a local restaurant before recessing for the summer. The Ladies Aid regular responsibilities are: care and changing of the altar paraments; the preparation of the sacraments; and providing refreshments & coffee after Sunday worship services. The organization also serves luncheons for funerals upon request; makes and hangs cedar garlands for the Christmas decoration in the church; and organizes fairs and Vacation Bible School. Our Sunshine Lady remembers our sick and shut-ins with cards throughout the year. The Ladies sponsor a Tree of Love each Christmas at which time new gifts are gathered and delivered to Stapleton Union AME Church in time for their Christmas Party in their Community as part of their outreach mission. For more information, go to our “Community Outreach” page and “Tree of Love” page.